The software, downloadable from this web page, can be used to estimate more than 50 monthly, seasonal, and annual variables, including many economically or biologically relevant variables such as growing and chilling degree days, heating and cooling degree days, drought indices, beginning and end of the frost-free period, etc. Unlike our North America-wide software packages, the model for the 1961-1990 normal reference period is based on the Alberta Climate Model, implemented with an ANUSpline interpolation of a very large number of weather stations that are not publicly accessible. The model has been proven accurate for this region, and we therefore recommend it for research that focuses on Alberta. Historical data since 1901 are based on the CRU-TS 2.1 (Mitchell & Jones, 2005, Int J Climatol 25: 693-712) but has been updated to 2013 with CRU-TS 3.22. Future projections are based on 15 AOGCMs of the CMIP5 multimodel dataset corresponding to the IPCC Assessment Report 5 (2013) x 2 Emission Scenarios (RCP4.5 and RCP8.5) x 3 standard time-slices (2020s, 2050s, 2080s). Average projected global warming increase (and likely range) for RCP4.5 are: +1.4°C (±0.5) by the 2050s; +1.8°C (±0.7) by the 2080s. For RCP8.5 they are: +2.0°C (±0.6) by the 2050s; +3.7°C (±0.9) by the 2080s. The 15 AOGCMs are CanESM2, ACCESS1.0, IPSL-CM5A-MR, MIROC5, MPI-ESM-LR, CCSM4, HadGEM2-ES, CNRM-CM5, CSIRO Mk 3.6, GFDL-CM3, INM-CM4, MRI-CGCM3, MIROC-ESM, CESM1-CAM5, GISS-E2R and were chosen to represent all major clusters of similar AOGCMs by Knutti et al (2013). Within clusters, we selected models that had the highest validation statistics in their CMIP3 equivalents. This program does not require installation. Download, unzip, and double click the executable file ClimateAB.exe. The program should run on all versions of Windows. If you receive the error message "COMCTL32.OCX missing", you have to install these libraryfiles. The program also runs on Linux, Unix and Mac systems with the free software Wine or MacPorts/Wine). 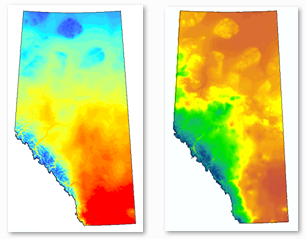 ClimateAB v3.21 - covers Alberta and includes CMIP5 projections corresponding to IPCC Assessment Report 5 (2013) and CRU-TS 2.1/3.22 historical data up to 2013. Legacy CMIP3 multimodel future projections corresponding to IPCC Assessment Report 4 (2007). To use them, unzip the archive and place the .gcm files into the GCMdat folder of ClimateAB. Legacy multimodel future projections corresponding to IPCC Assessment Report 3 (2001). To use them, unzip the archive and place the .gcm files into the GCMdat folder of ClimateAB. For usage, cite "Climate data has been generated with the ClimateAB v3.21 softwarepackage, available at http://tinyurl.com/ClimateAB, based on methodology described by Mbogga et al. (2010) and Alberta Enviroment (2005)." Alberta Environment. 2005. Alberta Climate Model (ACM) to provide climate estimates (1961- 1990) for any location in Alberta from it geographic coordinates. Alberta Environment Publ. No. T/749. ISBN No. 0-7785-3939-3 (Printed Edition), ISBN. 0-7785-3941-5 (On-line Edition).